In its typically understated manner (well, unstated -- the band doesn't mention it on its sole offical web presence, this MySpace dojo), the sophomore set from Philadelphia's power-glammers/paw glimmers The Get Quick was issued May 29. See You In The Crossfire potently showcases the psychotropic rock ("Chemical Reaction"), winking wit ("X-Fire") and disheveled romance ("Angels With Powdered Noses") that characterizes band leader Erik Evol's songwriting. More modest production (or at least less aurally dense versus the more lush material from 2005's solid and more synth-informed How The Story Goes) imbues the set with a palpable energy more representative of the band's live assault. EMusic has the album for sale right here, and the hard-copy is available via all the usual digital storefronts, too. Opening with a sound collage of cooing women and 'splosions and launching into the scorcher "Renting A Room," from there, our first impression is the set lives up to Evol's promise here of "a no-holds-barred buzzsaw rush of songs designed to melt your face off from the get-go." Face-melting numbers include "Renting A Room," the pounding marcher "My Enemy" and the aforementioned and revamped version of the older Evol composition "Chemical Reaction." 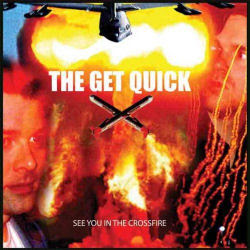 The latter song's bridge section and lacerating guitar solo is the closest thing we've heard on a Get Quick recording to the draw-jopping late '90s live performances of the band's pre-cursor, MantaRay (sadly, we haven't seen Evol and his henchmen perform since the night before we moved to Boston in 1999). And yet, See You In The Crossfire has more than one gear. "Fashion Street," which is oddly similar to Love As Laughter's excellent "Canal Street," is an affecting and straightforward pop-rocker, with a wild tremolo/vocoder type effect at the close. And oft-played cover of The Beatles' "She Said, She Said" and album highlight "The Blinds" both plod a step slower than you'd expect, letting Evol land every lyric like a blow and allowing drummer Mitchell Joy to deliberately bring the songs home like one of those guys with flashlights on an airport tarmac. There is but one Get Quick show booked right now; if you are in the band's hometown of Philadelphia July 5, head over to the Khyber. Here's an MP3 of one of the tunes Rainbow Quartz is sort of offering at its page for The Get Quick (the link is there, but it doesn't point to an MP3 file just yet).